to make a difference for our communities. Details research-informed and practitioner-approved Standards for creating and sustaining quality youth mentoring programs and consequently, impactful mentoring relationships. The Fourth Edition, released in September 2015, reflects the most up-to-date research, practice, and thinking in the mentoring field. that provides tips and strategies for developing and strengthening youth mentoring programs. As the number of Americans over the age of 50 continues its pace as the fastest growing population, the need for positive adult role models has never been greater. MENTOR estimates that nearly 15 million young people could benefit from high-quality, formal mentoring relationships. Linking these youth with these older adults is a vital strategy to help close the mentoring gap. The Wisdom of Age: A Handbook for Mentors is a comprehensive resource designed to offer practical information as well as real tools to develop and strengthen successful mentoring relationships between 50+ mentors and today’s young people. Youth: A Toolkit for Program Coordinators acts as a supplemental guide to MENTOR’s How to Build a Successful Mentoring Program Using the Elements of Effective Practice—a step-by-step toolkit that provides tips and strategies for developing and strengthening youth mentoring programs. FREE Mentoring Program Technical Assistance Now Available! The goal of the National Mentoring Resource Center (NMRC), is to contribute to the push for increasing the quality and effectiveness of mentoring programs and mentoring relationships across the county. The NMRC encourages practitioners to incorporate evidence-based practices in their work. 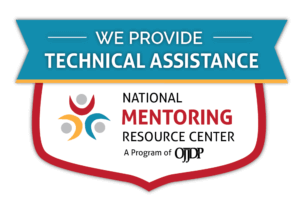 Selected by the Department of Justice Office of Juvenile Justice and Delinquency Prevention (OJJDP), MENTOR has established the NMRC to focus efforts on creating a center dedicated to training and technical assistance for mentoring. To apply for this awesome new resource, click here! Or for questions feel free to email us. An E-learning experience. It was developed to provide new programs with the knowledge and tools to build a solid foundation for a quality mentoring program. Each of the ten sessions included in this program reviews best practices for designing, launching, operating, and sustaining a quality youth mentoring program based on the Elements of Effective Practice 4th Edition. These modules will support you in increasing your knowledge, learning the skills and building the infrastructure necessary to support positive youth outcomes through mentoring. Click here to access the Starting a Youth Mentoring Program e-learning experience. Check out the video library of previously held webinars by the National Mentoring Resource Center. Content includes: “Reentry Mentoring: Conversations from the Field on Working with System Involved Youth”, “National Mentoring Month: Mentoring In Real Life”, “Mentoring Youth from Military Families: Lessons Learned and Strategies”, and many other topics. AmeriCorps VISTA is a national service program designed specifically to fight poverty. VISTA has been on the front lines in the fight against poverty in America for more than 52 years. With a focus on the organizational systems that directly impact the quality of youth mentoring relationships, VISTA members use human capital resources at select start-up or existing host mentoring programs to support and develop organizational capacity, resiliency and to drive improved outcomes. MOST proudly serves as a statewide intermediary sponsor for AmeriCorps VISTA projects supporting more and better after school, summer programs, and now mentoring programs for Maryland youth. 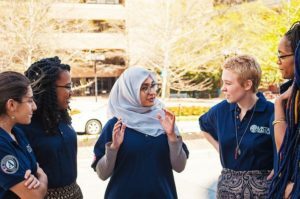 Now in its 6th year of programming, our AmeriCorps VISTA members serve as a catalyst for change, living and working alongside community members to advance local solutions. MOST VISTA members find creative and lasting solutions to build capacity for out of school time, youth development, and mentoring organizations.